I obtained my PhD in Chemistry from Deakin University investigating chiral organotin hydrides for radical chemistry, using both experimental and theoretical methods. Following my PhD I took up a post-doctoral position at ANU with Professor Leo Radom to develop high-level theoretical methods to accurately describe radical reaction mechanisms. I then accepted a post-doctoral position with Professor Irene Yarovsky at RMIT University to design nano-scale clean coatings using force-field based theoretical methods. I was subsequently appointed a Research Fellow at RMIT and investigated the chemistry of aluminium nano-particles, with a particular focus on hydrogen storage applications. 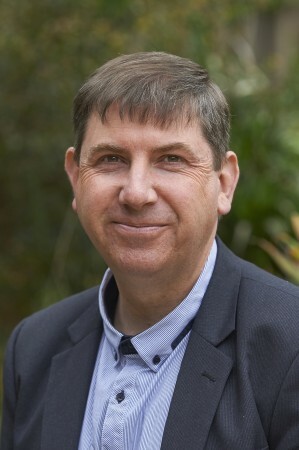 I then moved to Murdoch to take up a lecturing position and establish a Physical / Computational Chemistry research group. 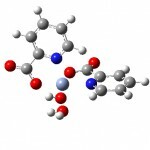 My expertise is in the area of Physical Chemistry, Materials simulation and Computational Chemistry and involves applying an extensive range of methodologies including electronic first principles and forcefield / classical methods to chemical, biological and materials related problems. (iii) design pigments for heat insulating coatings. A collaboration with Jiuxu Song (Xian University, China) to investigate Silicon-carbide nanotubes. A collaboration with Professor Akitomo Tachibana (Kyoto) to explore the physical chemistry of main-group metal particles. The properties of metal clusters can differ significantly from that of bulk materials and are often dependent on not only the composition but also the size of the clusters. As a result, cluster based materials are increasingly being investigated for their reactivity and catalytic activity which may be enhanced due to their high surface-to-bulk ratio. Theoretical methods are used to determine the structures and stabilities of novel gallium-based clusters and assemblies. 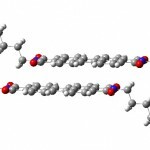 Theoretical calculations provide insight to the physical and chemical interaction of small molecules with these novel assemblies, through the identification of transition states and determination of reaction energetics. Molecular dynamics simulations provide a theoretical means of estimating the thermal stability of the clusters. Investigation of the Stability of Chromium(III) based Anti-diabetic compounds. The biological role of chromium(III) remains highly contentious with some research suggesting that this metal ion is an essential element in human nutrition and has a role in glucose metabolism, while other reports reject this pointing to potential toxic effects. The aim of this research is to use experimental and theoretical techniques to investigate the stability of common chromium(III) supplements. The project will involve synthesizing these compounds then measuring their stability and isomerism at different pHs using a range of analytical techniques (NMR, Raman, UV-Vis spectroscopy) and using state-of-the-art computational chemistry techniques to validate the spectral assignments. This work has important implications for the treatment of Type 2 diabetes and in understanding the potential toxicity of chromium based dietary supplements. Density Functional Theory methods are used to theoretically characterise a series of perylene derivatives that have previously been identified to act as near-infrared reflecting pigments. A range of structural and electronic properties are investigated in an attempt to identify if a relationship exists between these parameters and the observed trends in NIR-reflectance. Overtones and combination modes of fundamental IR vibrations appear to be particularly important in explaining the observed variations in NIR reflectance/absorbance. Aromatic groups lead to a small number of intense NIR bands, while alkyl groups generally lead to a greater number of less intense NIR bands. However, neighbouring group effects and/or a molecular dipole moment can substantially alter the intensity of these bands. The next phase of this work is to study the properties of aggregates of these pigments. Eucalypts have often been associated with soil water repellency under natural conditions and can have a potentially serious impact on water movement across and within the soil. Water repellency develops because of the formation of hydrophobic coatings on soil particles and this reduces a soil’s ability to absorb water. Water repellency is broadly related to a soil’s surface area and is thus more likely to occur on sandy surfaced soils although there are also reports of occurrence on soils with clay content. It is clear that further research is required to characterize the amounts and composition of these organic compounds. This would identify the cause of this particular phenomenon and help with amelioration strategies. Further studies could also examine variation in water repellency across different species, which would show if different species secrete similar compounds. 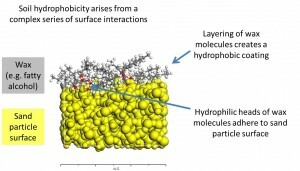 Soil Water Repellence: A Molecular Dynamics Study of Amphiphillic Compounds on Mineral Surfaces, D. J. Henry, N. Daniel, S. M. Mijan, R. J. Harper, RACI Physical Chemistry 2016 (PC16), Christchurch, New Zealand, 2016. Reactivity of Gallium Nanoclusters, D. J. Henry, RACI Physical Chemistry 2013 (PC13), Hobart, Australia, 2013. 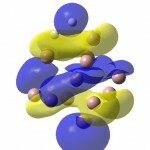 Stability and Reactivity of Gallium Clusters, D. J. Henry, RACI Inorganic Chemistry 2011 (IC11), Perth, Australia, 2011. Aluminium clusters for hydrogen storage, D. J. Henry, A. Varano, and I. Yarovsky, 11th Australian Molecular Modelling Conference (MM2007), Melbourne, Australia, November 27-30, 2007. Nanocarbon interactions with coatings: An insight from molecular dynamics studies, D. J. Henry, E. Evans, and I. Yarovsky, Organic and Physical Chemistry Conference, Adelaide, February 2007. Molecular dynamics study of carbon nanoparticle interactions with silica and polyester surfaces, D. J. Henry, E. Evans and I. Yarovsky, Molecular Modelling 2006, Perth, April 2006. Theoretical nanoscale design of self-cleaning surfaces, D. J. Henry, C. A. Lukey, E. Evans and I. Yarovsky, Pacific Rim Conference in Nano Science, Broome, Australia, September 2004. Podjarnee Sangmanee – Carbon stores and dynamics under forests in deep (>10 m) soils (with Prof. B. Dell, Prof. R. Harper). Mohammed Kabir Uddin – Investigating the Biochemical Pathways of Chromium using Computational Chemistry (with Dr Leonie Hughes, Dr David Ralph). S. M. M. Uddin, N. R. R. Daniel, R. J. Harper, D. J. Henry (2017) Why do biogenic volatile organic compounds (BVOCs) derived from vegetation fire not induce soil water repellency? Biogeochemistry 134,147–161. K. M. Uddin, R. A. Poirier, D. J. Henry, (2017) Investigation of mono-​, bis- and tris-​glycinatochromium(III)​: Comparisons of computational and experimental results. Polyhedron 130, 81-93. K. M. Uddin, D. J. Henry, A. I. Alrawashdeh, P. L. Warburton, R. A. Poirier, (2017) Mechanism for the deamination of ammeline, guanine, and their analogues Structural Chemistry (in press). K. M. Uddin, A. Md. Habib, D. J. Henry, (2017) Investigation of the Spectroscopic, Thermal and Electrochemical Properties of Tris-​(glycinato)​chromium(III). ChemistrySelect 2(5), 1950-1958. P. Sangmanee, B. Dell, R. J. Harper, D. J. Henry, (2017) Quantification of deep soil carbon by a wet digestion technique. Soil Research 55, 78-85. K. M. Uddin, D. J. Henry, (2016) Further Theoretical Studies of the Aquation of Chromium(III) Chloride Nutritional Supplement: Effect of pH and Solvation, Chem. Select, 1, 5236 – 5249. J. Song, H. Liu, D. J. Henry, (2016) Layer effects on electronic structures of multi-walled armchair silicon carbide nanotubes.Comput. Mater. Sci. 125, 117-122. K.M. Uddin, D.J. Henry, R.A. Poirier, P.L. Warburton,(2016) Calculated bond dissociation energies and enthalpy of formation of α-amino acid radicals. Theo. Chem. Acc. 135 (9), 224-1 – 224-13. K. M. Uddin, R. Poirier, D. J. Henry, (2016), Mechanistic study of the aquation of nutritional supplement chromium chloride and other chromium(III) dihalides, Computational and Theoretical Chemistry, 1084, 88 – 97. D. J. Henry, K. Ichikawa, H. Nozaki, A. Tachibana, (2016), Bonding in doped gallium nanoclusters: Insights from regional DFT, Computational Materials Science, 115, 145 – 153. J. Song, D. J. Henry, (2016) Stability and electronic structures of double-walled armchair germanium carbide nanotubes, Computational Materials Science 111, 86-90. K. Uddin, D. Ralph, D. J. Henry, (2015), Mechanistic investigation of halopentaaquachromium (III) complexes: Comparison of computational and experimental results, Computational and Theoretical Chemistry, 1070, 2015, 152 – 161. D. J. Henry, D. Laird, (2014), How Old is my Bronze Cannon? A Laboratory Exercise Linking Analytical Chemistry, Spectroscopy and Metallurgy, Journal of Laboratory Chemical Education, 2, 4, 73 – 78. L. Shaw, G. Yiapanis, D. J. Henry, S. Maclaughlin, E. Evans, I. Yarovsky, I., (2013), Surface crosslinking effects on contamination resistance of functionalised polymers, Soft Matter, 9, 1798 – 1806. B. Kaur, S. Bhattacharya, D. J. Henry,(2013), Interpreting the near-infrared reflectance of a series of perylene pigments, Dyes and Pigments, 99, 502 – 511. D. Laird, D. J. Henry, (2013), Is There Ni in My Liquor? A Hands-On Laboratory Exercise for Relating Chemistry to Extractive Metallurgy, J. Chem. Edu., 90, 12, 1671 – 1674. D. J. Henry, (2013), Hydrogen Adsorption on Gallium Nanoclusters, The Journal of Physical Chemistry Part C: Nanomaterials, Interfaces and Hard Matter, 117, 49, 26269 – 26279. D. J. Henry, (2012), Structures and stability of doped gallium nanoclusters, The Journal of Physical Chemistry Part C: Nanomaterials, Interfaces and Hard Matter, 116, 46, 24814 – 24823. G. Yiapanis, D. J. Henry, S. Maclaughlin, E. Evans, I. Yarovsky, (2012), Effect of Substrate on the Mechanical Response and Adhesion of PEGylated Surfaces: Insights from All-Atom Simulations, Langmuir: the A C S journal of surfaces and colloids, 28, 50, 17263 – 17272. E. Prime, D. J. Henry, I. Yarovsky, G. Qiao, D. Solomon, (2011), Comb polymers: Are they the answer to monolayer stability?, Colloids and Surfaces A: Physicochemical and Engineering Aspects, 384, 1-3, 482 – 489. M. Plazzer, D. J. Henry, G. Yiapanis, I. Yarovsky, I., (2011), Comparative study of commonly used molecular dynamics force fields for modeling organic monolayers on water, The Journal of Physical Chemistry Part B: Condensed Matter, Materials, Surfaces, Interfaces & Biophysical, 115, 14, 3964 – 3971. A. Menon, D. J. Henry, T. Bally, L. Radom, (2011), Effect of substituents on the stabilities of multiply-substituted carbon-centered radicals, Organic & Biomolecular Chemistry, 9, 3636 – 3657. A. Varano, D. J. Henry, I. Yarovsky, (2011), Role of hydrogen in dimerizaton of aluminum clusters: A theoretical study, The Journal of Physical Chemistry Part A: Molecules, Spectroscopy, Kinetics, Environment and General Theory, 115, 26, 7734 – 7743. D. J. Henry, P. Szarek, K. Hirai, K. Ichikawa, A. Tachibana, I. Yarovsky (2011) Reactivity and Regioselectivity of Aluminium Nanoclusters: Insights from regional density functional theory J. Phys. Chem. C 115, 1714. D. J. Henry, V. I. Dewan, E. Prime, G. Qiao, D. H. Solomon, I. Yarovsky (2010) Monolayer structure and evaporation resistance: An MD study of octadecanol on water. J. Phys. Chem. B 114, 3869. A. Varano, D. J. Henry, I. Yarovsky, (2010) DFT study of H adsorption on magnesium doped aluminium clusters.J. Phys.Chem. A 114, 3602. G. Yiapanis, D. J. Henry, E. Evans, I. Yarovsky (2010) Simulations of nano-indentation of polymer surfaces: Effects of surface crosslinking on adhesion and hardness. J. Phys. Chem. C 114, 478. D. J. Henry, A. Varano, I. Yarovsky (2009) First principles investigation of H addition and abstraction reactions on doped aluminum clusters. J. Phys.Chem. A, 113, 5832. A. Budi, D. J. Henry, J. D. Gale, I. Yarovsky (2009) Comparison of embedded atom method potentials for small aluminium cluster simulations. J. Phys. : Condens. Matter, 21, 144206. D.J. Henry, I. Yarovsky, (2009) Dissociative adsorption of hydrogen molecule on aluminium clusters: Effect of charge and doping. J. Phys. Chem. A, 113, 2565. D. J. Henry, A. Varano, I. Yarovsky, (2008), Performance of Numerical Basis Set DFT for Aluminum Clusters, The Journal of Physical Chemistry Part A: Molecules, Spectroscopy, Kinetics, Environment and General Theory, 112, 9835 – 9844. G. Yiapanis, D. J. Henry, E. Evans, I. Yarovsky, (2008), Molecular dynamics study of polyester surfaces and fullerene particles in aqueous environment, The Journal of Physical Chemistry Part C: Nanomaterials, Interfaces and Hard Matter, 112, 46, 18141 – 18149. G. Yiapanis, D. J. Henry, E. Evans, I. Yarovsky, (2007), Effect of surface composition and atomic roughness on interfacial adhesion between polyester and amorphous carbon, The Journal of Physical Chemistry Part C: Nanomaterials, Interfaces and Hard Matter, 111, 3000 – 3009. G. Yiapanis, D. J. Henry, E. Evans, I. Yarovsky, (2007), Effect of Aging on Interfacial Adhesion between Polyester and Carbon-based Particles: A Classical Molecular Dynamics Study, The Journal of Physical Chemistry Part C: Nanomaterials, Interfaces and Hard Matter, 111, 6465 – 6472. D. J. Henry, E. Evans, I. Yarovsky, (2007), A molecular dynamics study of siloxane diffusion in a polymer-melamine solution, Polymer, 48, 2179 – 2185. D. J. Henry, E. Evans, I. Yarovsky (2006) Classical molecular dynamics study of fullerene interactions with silica and polyester surfaces, J. Phys. Chem. B 110, 15963. D. J. Henry, G. Yiapanis, E. Evans, I. Yarovsky, (2006) Colorbond® meets nanotech: Understanding coating interactions with the environment, Chemistry in Australia, 2006, 11. M. L. Coote; D. J. Henry (2005) Effect of substituents on radical stability in reversible addition fragmentation chain transfer polymerization: An ab Initio Study, Macromolecules 38, 1415. D. J. Henry, C. A. Lukey, E. Evans, I. Yarovsky (2005) Theoretical study of adhesion between graphite, polyester and silica surfaces, Mol. Simul. 31, 449. M. L. Coote; D. J. Henry, (2005) Computer-aided design of a destabilized RAFT adduct radical: Toward improved RAFT agents for styrene-block-vinyl acetate copolymers, Macromolecules 38, 5774. D. J. Henry, G. Yiapanis, E. Evans, I. Yarovsky, (2005) Adhesion between graphite and modified polyester surfaces: A theoretical study, J. Phys. Chem. B 109, 17224. B. J. W. Barratt; C. J. Easton; D. J. Henry; I. H. W. Li; L. Radom; J. S. Simpson, (2004) Inhibition of peptidylglycine a-amidating monooxygenase by exploitation of factors affecting the stability and ease of formation of glycyl radicals, J. Am. Chem. Soc. 126, 13306. R. Gómez-Balderas; M. L. Coote; D. J. Henry; L. Radom, (2004) Reliable theoretical procedures for calculating the rate of methyl radical addition to double and triple carbon-carbon bonds. J. Phys Chem A108, 2874. D. J. Henry; R. Gómez-Balderas; M. L. Coote; L. Radom (2004) Comparison of the kinetics and thermodynamics for methyl radical addition to C=C, C=O and C=S double bonds.J. Am. Chem. Soc. 126, 1732. G. P. F. Wood, D. J. Henry and L. Radom (2003) Performance of the RB3-LYP, RMP2, and UCCSD(T) procedures in calculating radical stabilization energies for •NHX radicals.J. Phys Chem A 107, 7985. D. J. Henry; A. L. J. Beckwith; L. Radom (2003) Homo-anomeric effect in 1,2-dimethoxyethyl radical. Aust. J. Chem. 56, 429. D. J. Henry; M. B. Sullivan; L. Radom (2003) G3-RAD and G3X-RAD: Modified Gaussian-3 (G3) and Gaussian-3X (G3X) procedures for radical thermochemistry. J. Chem. Phys. 118, 4849. D. J. Henry; C. J. Parkinson; L. Radom (2002) An assessment of the performance of high-level theoretical procedures in the computation of the heats of formation of small open-shell molecules.J. Phys. Chem. A 106, 7927. D. J. Henry; C. J. Parkinson; P. M. Mayer; L. Radom, (2001) Bond dissociation energies and radical stabilization energies associated with substituted methyl radicals.J. Phys. Chem. A 105, 6750. D. Dakternieks; K. Dunn; D. J. Henry; C. H. Schiesser; E. Tiekink, (1999) Organostannanes derived from (-)-menthol: Controlling stereochemistry during the preparation of (1R, 2S, 5R)-menthyldiphenyltin hydride and bis((1R, 2S, 5R)-menthyl)phenyltin hydride.Organometallics, 18, 3342. D. Dakternieks; D. J. Henry; C. H. Schiesser, (1999) Steric effects in radical chemistry: Absolute rate constants and Arrhenius parameters for the reactions of a series of alkyldiphenyltin hydrides with primary alkyl radicals. J. Phys. Org. Chem. 12, 233. D. Dakternieks, D. J. Henry; C. H. Schiesser (1998) Equilibria in free-radical chemistry: An ab initio study of hydrogen atom transfer reactions between silyl, germyl and stannyl radicals and their hydrides. ; Organometallics, 17, 1079. D. Dakternieks; D. J. Henry; C. H. Schiesser (1998) Silanes and germanes as free-radical reducing agents: An ab initio study of hydrogen atom transfer from some trialkylsilanes and germanes to alkyl radicals. J. Chem. Soc., Perkin Trans. 2, 591. D. Dakternieks; D. J. Henry; C. H. Schiesser (1997) Stannanes as free-radical reducing agents: An ab initio study of hydrogen atom transfer from some trialkyltin hydrides to alkyl radicals. J. Chem. Soc., Perkin Trans. 2, 1665. D. J. Henry and L. Radom (2001) Theoretical thermochemistry of radicals.In Quantum-Mechanical Prediction of Thermochemical Data; Cioslowski, J. (Ed). ; Kluwer: Dordrecht, The Netherlands..